Many patients will have the above named symptoms for months or years. They will seek medical attention only when there will be an episode of acute exacerbation. However, a careful history usually reveals the presence of symptoms prior to the acute exacerbation. The dyspnea is more when the patient does activities involving significant arm work, particularly at or above shoulder level. Conversely, activities that allow the patient to brace the arms and use accessory muscles of respiration are better tolerated.e.g. pushing a shopping cart, walking on a treadmill or pushing a wheelchair. As COPD advances, the principal feature is worsening dyspnea on exertion with increasing intrusion on the ability to perform vocational or avocational activities. In the most advanced stages, patients are breathless doing simple activities of daily living. In the early stages of COPD, patients usually have an entirely normal physical examination. Current smokers may have signs of active smoking, including an odour of smoke or nicotine staining of fingernails. In patients with more severe disease, we may note a prolonged expiratory phase and may include expiratory wheezing. In addition, signs of hyperinflation include a barrel chest and enlarged lung volumes with poor diaphragmatic oscillations as assessed by percussion. Patients may also exhibit use of accessory muscles of respiration, sitting in the characteristic "tripod" position to facilitate the actions of the sternocleidomastoid, scalene and intercostal muscles. Patients may develop cyanosis, visible in the lips and nail beds. Although traditional teaching is that patients with predominant emphysema, termed "pink puffers," are thin and noncyanotic at rest and have prominent use of accessory muscles, and patients with chronic bronchitis are more likely to be heavy and cyanotic ("blue bloaters"), current evidence demonstrates that most patients have elements of both bronchitis and emphysema and that the physical examination does not reliably differentiate the two entities. Advanced disease may be accompanied by systemic wasting, with significant weight loss, bitemporal wasting and diffuse loss of subcutaneous adipose tissue. This syndrome has been associated with both inadequate oral intake and elevated levels of inflammatory cytokines. Such wasting is an independent poor prognostic factor in COPD. Some patients with advanced disease have paradoxical inward movement of the rib cage with inspiration (Hoover's sign), the result of alteration of the vector of diaphragmatic contraction on the rib cage as a result of chronic hyperinflation. 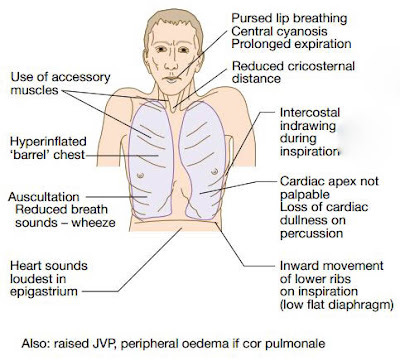 Signs of overt right heart failure, termed cor pulmonale, are relatively infrequent since the advent of supplemental oxygen therapy. Clubbing of the digits is not a sign of COPD and its presence should alert the clinician to initiate an investigation for causes of clubbing. In this population, the development of lung cancer is the most likely explanation for newly developed clubbing.